In case anyone was wondering there are sapphires at Lisle, I happened to get lucky my last trip out that way. The occurrence is mentioned in one of the old reports (twelvetrees i think) and mentioned small sapphires in the wash. Well these ones certainly are small. And I have also found a mostly clear amethyst crystal with a flash of purple at the tip. Again very small, about 8mm x 2mm. They are kind of hard to spot amongst the hundreds of spinel, but im tempted now to go back and have a good look through a bucket of dirt i have sitting around that i panned the gold out of. I wouldn't say Lisle was the go-to place for sapphires because these are the first I have seen after a few trips out that way but at least we know they are there. Well done, Ratters. 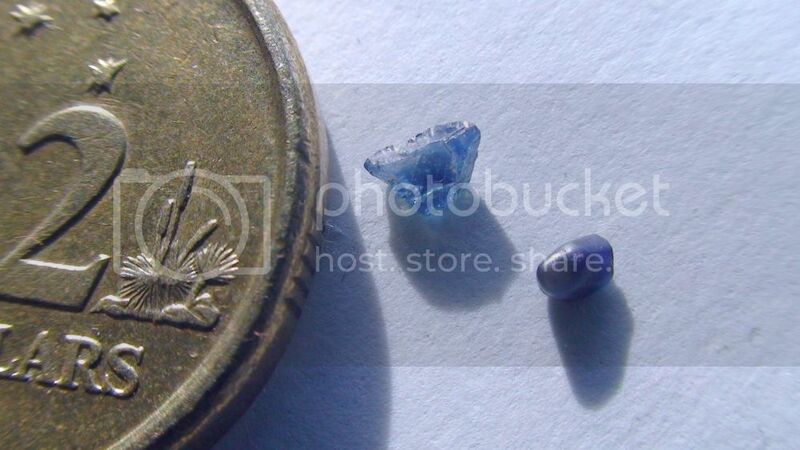 I have only ever seen a bit of black spinel & small zircons out there but never sapphires. Have been focussed mainly on that yellow stuff that seems to always get caught up in the corner of my pan. That blue is more beautiful than anything ive ever seen from Ceylon. like a deep cornflower blue. stunning stuff. I will be heading to NE for some gemstones in about 2 weeks for a few days if anyone is interested ? i will camp at the Weld camp area weather permiting. time to wet the sieves ! i have an area in mind that produces some fair stones --all welcome . will post dates here - maybe 6th sept to 10th or so .